One of the things I already love about working at Chefs Collaborative is the opportunity to engage with our Locals – groups of chefs in geographic regions of the US who are working together to cultivate community-based networks of food professionals and share best practices for running sustainable kitchens. Who knew that within my first week on the job I’d get to go to a knife factory, a farm, and a local restaurant with a group of amazing New England chefs?! #Ilovemyjob. On December 11, I got a chance to travel to three different spots in MA and NH with our Portsmouth Locals and Rob, our Network Manager. We were also lucky enough to have Board Member Seth Caswell, based in Seattle, join us for the day. Our first stop was R Murphy Knives in Ayer, MA – a company that I admittedly hadn’t heard of. But by the time I left, I felt like I knew the owners Mimi and Mark well. 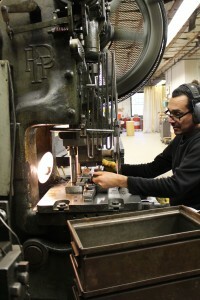 The company has been in business since 1850 and has had just four owners in its entire history. R Murphy still makes its knives right here in the USA, of American materials, with humans and machines working together (what a sharp idea – zing). In fact, they are one of only four or five remaining US manufacturers of knives. Mimi and Mark took us on a tour of the whole factory, and chefs got to see their over 40 different kinds of knives, as well as see the processes by which they manufacture the knives – most of them hand-stamped. Watching the knife-making process up close; this rockstar employee has been there for more than 25 years. They nickname themselves “a factory lost in time,” but it turns out the methods they use are often proven to be the best out there – working more consistently than fancy lasers and automated machines to provide super-sharp edges and perfectly straight lines on their high-carbon blades. While they are a seemingly small company, they do big business – they make over 800,000 knives each year. Mimi was interested in getting chefs’ input on the kinds of knives they need, and what they look for when purchasing restaurant goods. From there, we bounced over to Heron Pond Farm’s new construction site in Kensington, NH. There, Andre Cantelmo and team are working together to create a food hub; a community space where farmers, restaurants, and consumers can come together to share in the yearly harvest and learn from each other. They have a pretty amazing spot in development; they are building out a public marketplace, as well as a kitchen where local chefs can hold dinners and classes, an additional room for cooking, a basement for temperature-controlled storage and house-curing foods, and a raw space they can transform at a moment’s notice. They also have a gorgeous outdoor area, and I could already imagine folks lingering at picnic tables overlooking the fields during long summer days. We discussed how much work it is setting up an operation like this, their goals, and learned that they plan to open in May of next year. 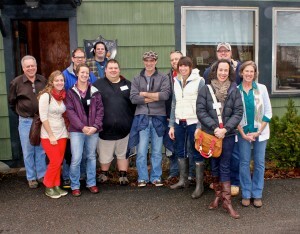 After Heron Pond Farm, we landed at the Ale House in Amesbury, MA and got to know one another. There, the fearless outgoing Local leader – and Board Member – Evan Mallett of Black Trumpet (NH) introduced Rob Martin (The Oaks Country Club) and Mark Segal (The One Hundred Club), two outstanding chefs who will be taking the reins as the new co-leaders of the Seacoast Local. This means that Rob and Mark will be working together in the year to come to facilitate Local meetings and field trips like this one. For someone entering the food world, it was incredibly inspiring to see a group of chefs taking time during their precious hours outside of the kitchen to meet other chefs, visit local businesses, and discuss what inspires them. I know this Local has already accomplished great things thanks to their local leadership and consistent involvement, and I’m very excited to see what they have in store in 2013.